Thanks to Gluten-Free Gena for inviting me to be a guest on her blog. My name is Tracy Anderson and I’ve been Gluten-Free for a little over 2 years. I had already lost 80 lbs when I stumbled across a book by Dr. William Davis titled “Wheat Belly”. At that point in time I’d already given up sugar and most grains however, I did occasionally eat Ezekiel bread (which is made with sprouted wheat and has a low glycemic index due to the sprouting process). I’ve not knowingly eaten any wheat, sprouted or not, since finishing that book! Bottom line, wheat is wheat and causes inflammation which can lead to other issues besides mere weight gain…regardless of whether it is sprouted, bleached, whole grain, etc. Currently I do not eat any grains whatsoever, as I found they are all causing weight gain (and other less visible issues, I’m sure). I am trying out some strategies to get my body to allow some of the less harmful grains (such as white rice & quinoa) but it is still work-in-progress and I unfortunately have no conclusions to share as of yet. When Eugena asked me to be a guest blogger, I really wanted to write something helpful but I procrastinated because I couldn’t decide what to write about. I am constantly seeking health and nutrition information for my own purposes. There is such an array of information that could be beneficial to share but I am typically not one to offer unsolicited advice. Recently a friend who is struggling with weight and inflammation issues asked me a favor. She wanted me to write down my grocery list for her. She wants to improve her health and is interested in my strategies, but she was having difficulty understanding what foods I buy. In her mind, my diet consisted of very limited food choices. I’m sure she imagined me munching on nothing but lettuce all week long! Well, I collected several old grocery shopping lists and grocery receipts and compiled that list she is requesting. I think she will be surprised to see that my diet really isn’t so limited! I hope there are others out there that wonder what us gluten-free, grain-free, sugar-free, whole-food-only people eat….because that is today’s blog. 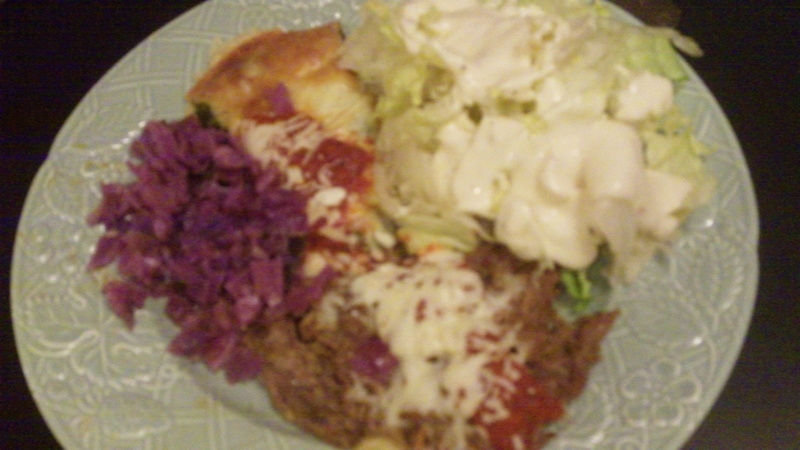 Dinner was Italian Beef with pizza margarita sauce and mozzarella cheese; salad with Marie’s Cream Italian salad dressing, sauteed red cabbage & spinach pie. Thank you very much Tracy, for taking the time to contribute to this blog! I am still learning the ropes of things I can and can’t eat and your grocery list is going to be a valuable resource for me as well as my readers. If anyone has questions for Tracy, ask away!